Bigasoft AVCHD Converter is easy to use, fast and omnipotent AVCHD video converter and AVCHD video editor software. 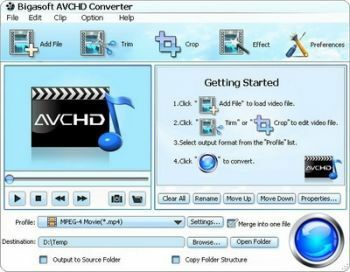 It can convert AVCHD HD-camcorder video in MTS, M2TS, MOD, TOD to a broad video formats including convert AVCHD to QuickTime, convert AVCHD to AVI, MP4, WMV, MKV, MPG, RM, RMVB, DivX, XViD, WebM, VP8 and more, and convert AVCHD to HD videos. It fully supports HD camcorder of Canon, Hitachi, JVC, Leica Camera, Panasonic, and Sony.